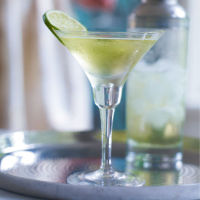 A Mad Men favourite, the Gimlet gets a summery twist. Shake everything except the lime slice together with the ice. Strain into a martini glass and decorate with the slice of lime. If you don’t have a shaker, just stir the first three ingredients together and pour over ice.